34 * 28 - my roadbike is a BMC Streetracer - nice light racing machine albeit not carbon. I tried and failed the Staircase on a 34*26 as Wiggle sent me a replacement cassette of the wrong ilk far too close to the date of the ride so I had little choice but to use it (the old one had worn out on my previous audax). The bike I used was my much heavier Hybrid I use for commuting. It should have had a 34*34 lowest gear and I might have been alright on that. Personal preferences and all that but I'd definitely recommend a compact chainset if you're doing hilly rides in Wales. 20%+ gradients are not uncommon around the parts there be dragons! Yeah I was probably overegging the 20% ones. They can be found quite easily if you look for them though. Within spitting distance of where I live (Cardiff) there are 21% slopes up the Senghennydd and Caerphilly mountains and (at least) 27% up the Penheol Ely road in Pontypridd. And I live in a relatively flat part of Wales. (I did do the Devil's Staircase on a compact once and nearly expired at the top). You've no idea how much better that makes me feel. Sorry I should really respond to your posts in one go CET. I managed nearly 60 mph on my compact descending the Preselis in Pembrokeshire last year - how much faster does one want to go on a bike? Well I just looked it up on Strava - looks a reasonable toughie. Aside from the real killers like the Staircase (which as CET says are only occasional on these rides and won't feature at all I don't think on the shorter 1 and 2 series rides) that's probably as hard as anything you'll typically encounter. What the main problem was was the frequency of them - it's not flat flat flat, BIG BILL, flat flat flat - they can just be relentless. Then of course i got over it and did actually manage to finish. If you've got company that will help you get through such things And the 3A is 300k - 200k rides don't do that to me - at least not yet. I saw 18% and 25% on that Edge hill plot on Strava by the way. That's steep. But it didn't looks sustained. The Devil's Staircase has a really sustained 25% slope - it doesn't relent for a good couple of hundred feet. It's nasty nasty nasty. I'm not sure having company is a good thing for me. I am better off on my own when things get bad so I can curse and moan and not offend anyone in the process. Plus, being genuinely scared of not being able to make it back does tend to focus the legs somewhat! Ooof, looks like a challenge in the making there then! Use a compact and a decent wide cassette--I`m now using an IRD 12-32 cassette, 34x 32 is very useful even though can just manage DS on bigger gear--in summer did it on 34 x 26 just to avoid using the 29 as it was at time. IMO there`s no shame in a small gear only knee pain on a bigger one ! Well I would tell you that 300 km is just a long 200 km and not that much harder - that's the general advice given around here. Having said that I've done 400km and 600 km too - the 400 km was as bad as the 300 for breaking the soul (worse actually I think). Oddly, I just went and did the 600 km with nowhere near the same level of mental breakdown. It did have its tough moments but not like the other two. Oh I sooo know what you mean. Love the Milk Race video - even Gethin Butler struggling up it. "What do you think of the Devil?" Having said that, the professionals still looked like they were riding up it. I'm sure I've never gone up it at the speed. But then I've always done at least 75 miles by the time I've got to the foot of it. Would be great to see the Tour of Britain take in this stretch of road but it would probably fail a risk assessment for the hairy descent on the other side. Yeah that might be true to be fair, I think I was spun out long before I stopped accelerating. My weight was definitely not a disadvantage at that moment in time. I know what you mean about going a long way before you get to the bottom of the target slope. I keep trying to do the Tumble just outside of Abergavenny which they do use on the ToB regularly but I've designed the route to have 6000 ft of climbing including two horrible climbs (the aforementioned Penheol Ely Rd in Ponty and another sustained 18%er north of there) before I get there. Hence I'm always completely burned out by the time I reach its foot. I've yet to do anything except grovel up the Tumble. I haven't walked but I haven't done it in anything like one go yet either. I can`t remember what year --early 90s I think---watching Milk Race on lower section Gamallt and a few had succumbed to walking, incl Russian junior world champion---but then looking at their gear setup of bottom 42 x 23 probably small wonder ! Well, I rode the Cambrian 1A yesterday and it was absolutely stunning. By far my favourite road ride that I have ever done. Got in to Rhayader pretty quick, as it's not far from Llandrindod, so didn't need supplies and controlled at the Museum. A lovely lady signed my card and was very much in shock when I explained the route. You all know what it is like, non-audaxers think 100 km is a MILLION MILES when to an audaxer it's just a short day out. With her warning of "Tregaron? It's pretty 'wild west' out there you know" I headed off up the mountain road into a ferocious headwind. This was, of course, all part of the plan as it would be a lovely tailwind on the way back after all those hills, so I smiled to myself, revelled in my new-found low gears and carried on spinning steadily upward. Eventually, the GPS pink line turns left. Left? There is no road left? Oh *heart sinks. There is a byway. Guess who hadn't redone the Cambrian1A file when she realised that bikehike in openstreetmap is happy to send bikes up green lanes and bridleways unless you tell it otherwise? Yes, that would indeed be me. It did go a long way to explaining why my original 105 km was significantly under the 113 km predicted for the ride. So I had some choices a) Panic, cry a bit and head back the way I came in a sulk b) Panic, but appreciate all the lovely riding done so far that day, and head back the way I came and even possibly ride some of the 1B I had done previously as I know that area well c) Don't panic, head onwards and see what happens. Sometimes A would have been the most likely option, but not yesterday, not in such a beautiful place. B very nearly happened, I was having such an enjoyable time I actually stopped caring about getting the audax done and was just happy to have got out so did consider it. In the end I went with C. What's the worst that could happen? All roads lead to roads and I would eventually end up either rejoining my pink line, or rejoining the A44. If I met the A44 first I decided I'd just turn round, and smash out a Strava time to the best of my ability back over the mountain road to Rhayader. If the absolute worst happened and I got totally lost and knackered, I could stay at the first hotel I found and sort it out in the morning. It would be fine! As time went on, I realised the road was heading south and, flicking out the GPS map, I would eventually re-find that pink line. Not that I cared. I could have been 50 miles off course at that point...I have never ridden such a stunning little lane in my whole life. Running alongside a totally deserted mythical valley with a gushing stream, kites overhead and just complete tranquillity. I thought about getting photos but realised with the headwind, climbing, long stop trying to work out where I was going to go if I kept following the road, and a sixth sense telling me the climbing was only just beginning, I pressed on. Not with the normal innate urgency I seem to have that prevents me from appreciating the surroundings though, just calming soaking everything in whilst cruising past. A brief interlude for an amazing bit of descent put an even bigger smile on my already-smiled-to-the-point-of-aching face. On entering a wee village I managed to grab a postie and get confirmation I was on the road to Tregaron so this settled me a bit as I was beginning to get concerned about my lack of fluids. The new bike didn't come with bottle cages so I just stuck an old one on thinking it would be more than enough to get me between stops. The stretch between Rhayader and Tregaron was a lot longer than expected and was very hungry and very thirsty for the last 10 km. Straight in the Spar to control with two bottles of Oasis and a carton of orange juice. Bliss, utter bliss! At this point I see a few riders coming into Tregaron "they look so much like audaxers" I chuckled to myself. "No, hang on, that one has a Carradice, they MUST be audaxers"......heading out toward Beulah I start seeing more and more, and then the familiar faces appear. "Ahhh the Elenydd 300!" It's funny, when you are on an event, you can ride for miles without seeing anyone else, but when heading in the opposite direction the gaps between riders are no where near as big as you would imagine. The climbing started again pretty quickly and became increasingly challenging, even with the new gearing, at one point I had to weave back and forth across the road to keep from stopping. Right at that moment I really wanted that chain to sit on that top sprocket, but it was having none of it. Bastid thing! Still, I made it up all the climbs, without stopping at any point, across that mountain road. What a road, it's immense! Who the hell thought putting that there was a good idea, well, thank you. So hard, yet so rewarding getting up to the top. If I am honest, I wasn't overly fond of the descent down what I now understand is the devils staircase. Now, I like going downhill very fast on a bike, but a mountain bike, with big tyres and lots of grip. Riding a skinny tired roadie down a narrow exceptionally steep gravelly and slightly potholed road, especially with a whole number of riders coming up (meaning no cheating and taking corners superwide) was not really my idea of fun. Still, looking at the faces of those riding up, it was still the better option heh heh. At the bottom of the Devils Staircase was a control for the 300 km and the volunteers were most kind and refilled my water bottle meaning I had plenty of fluid to get me to the next control. I couldn't stop for long though as was getting increasingly concerned with the ticking clock. The 'normal' 100 km time of 4 to 5 hours clearly wasn't going to apply to this one and I did wonder whether I would be back in the limit. Then I had an epiphany - who cares if I don't make it back? The ride wont be validated....but it wouldn't take away from what an amazing day and ride it had been so the whole thing had already been worthwhile. The audax validation would just be a bonus. Once the mountain road was over it was nicely undulating to Beulah. Or was it? I did ponder several times on the way back to the van whether things I was now considering to be 'small hills' were so because my perspective on what constitutes a climb had changed so much in the few hours preceding that point. All that climbing made me hungry but not for decent food. Oh no, on arriving at Beulah services the only thing I wanted to eat was a giant sized grab bag of Walkers crisps. These are becoming my audax food of choice. I carry all sorts of 'suitable' riding food (most of which returned with me to Llandrindod) but none of it compares to crisps for getting me back blasting along again. I don't ever eat crisps at home etc, so why I do on audaxes I don't know, but they work, and that's fine by me. The tailwind back from Beulah to Llandrindod was a blessing and picked up the pace considerably along the decent B roads meaning there was no danger of being out of time and arrived back at just gone 4. Glad you had a good day out jo :)Nice write up. Good job Rabbit, yes the scenery around their is STUNNING isn't it. No time for an epic ride report from today atm. However, here is a picture taken at 7 am this morning an hour out of Monmouth on the Cambrian 2A. 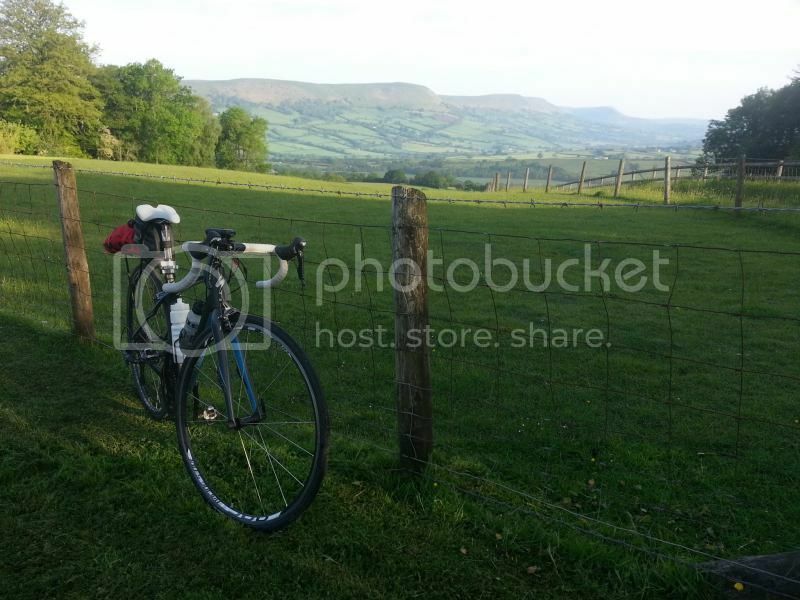 Another stunning Cambrian ride, would recommend. I liked the 2A too. Liked it so much I bought the company . Looks like the edge of the Black Mountain running north past Longtown. Nice photo. Woke up at 4:45 randomly,and figured it would be good practice for the P&K to get out of bed. Was at Monmouth for 5:45 am and most surprised to find the public toilets open at this time on a Sunday. Otherwise, of course, everything was closed so it was a cash-point control to start at 6 am. The leg over to Hay was fabulous. The lanes are mostly traffic free (although I guess it was a Sunday) and the scenery is stunning. Of particular note is the lane from Craswell to Hay. It's been patched and is fully open again. Definitely worth every stiff climb up. Although, if I am honest, I found the climbing on the 2A easily manageable throughout. It's notably less challenging than the 1A in terms of hills. I was most surprised to find I had easily covered 50 km by the time I reached Hay. It was the biggest stretch of the day and it was good to do it first I think. Hay to Llandrindod was again, utterly stunning. Just love the moors (Begwns?). Tiny little lanes across massive open vistas. Random sheep everywhere. In fact, all day I had sheep running in front and alongside the bike. I had to stop completely as a whole flock was being herded up the main road somewhere on the B4520. Sat by the lake in Llandrindod after getting very lost trying to follow JamesBradnors GPS, until I realised I had probably reached his parking area as he would have started from there and not Monmouth. Later in the ride I realised that my laziness in checking the GPS was a very bad thing....as I found myself contraflow on every one way system in the towns and nearly missed the A40 junction. 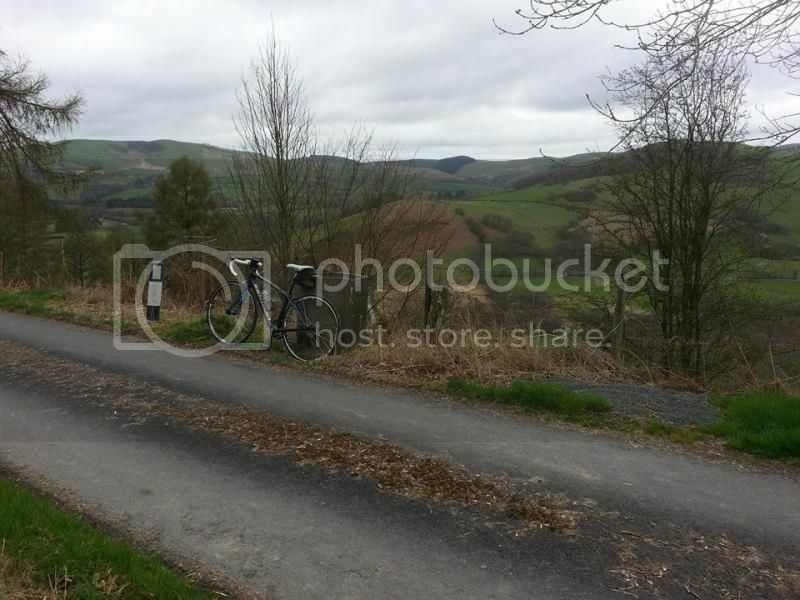 Llandrindod to Llanwrtyd meant a change in direction and straight into the oncoming S'westerly. It was a challenging stretch in this direction, the road is proper 'big rollercoaster' but the ups are very steep (15%+) in places and the headwind was reducing a lot of the run in speed from the downs. Not a particularly attractive road either, and, like many of the B-roads, takes a lot of traffic. It was, however, only a short section and Llanwrtyd is a lovely town.....now with a vegan friendly cafe that stocks vegan biscotti and does amaing soya lattes. I stopped and had a proper meal of beans on toast here. Llanwrtyd over to Brecon was by far my favourite section. The climb out of the town and up over the MoD land to 465 meters was a challenge, but a pleasant one, especially in the sunshine. Properly epic. There is no other way to describe it up there. It is like being on top of the world. Treeless moors with open views for miles to the West. Red flags warning of military activity, kites, good surface. Everything! From the very top, the gradient was lost incredibly slowly. I was so glad I did the ride in this direction. It felt like I was very subtly descending all the way through Brecon where I bounced the control with a fly-by-cash-point) to Abergavenny (another cash point). It almost felt like cheating. I was glad when the climbing started again as I knew I would have some climbing karma to pay back and the spiky road over to Rockfield was a challenge, mostly due to the nasty road surface which was so weathered it seemed almost unpaved in places. The bike was being kicked about and all the speed on the descents lost before the steepies. It was a hard, but rewarding, section of 'gain 40 m, loose 40 m, repeat) and the final descent into Monmouth was very much appreciated. Overall though, I was surprised at how easy I found the ride, I didn't struggle at any point with the climbs (mostly thanks to taking it steady and making a lot of use of that lovely 34*32, and the weather) and definitely had more in my legs on returning to Monmouth. My arrivee was the Coffee #1 on the High Street where I sat cooling off and, like most of the day, getting approached by random people asking about the ride.